June 17, 2018, 9:10 AM · You can count on one hand the number of articles that have been written about the retake. I’m being generous. Coming after a comfortable detache, the retake is a down bow followed by a lift, and then another down bow. It sounds easy enough, but a simple action like that can create quite a mess. There’s no mention of the retake in either Carl Flesch’s The Art of Violin Playing or Ivan Galamian’s Principles of Violin Playing and Teaching. One thing I discovered was a section that Galamian devoted to the “Roulé” on page 104. This made me realize that bowing issues create the need for names to identify them, and often what better language is there than French to give them importance? (Note sautillé (jump), martelé (hammer), collé (glue), ricochet, détaché, serré, lancé, fouetté (whip), and my favorite, bariolage (multi-colored). So far, the retake doesn’t have a French name, but it deserves more attention since it recurs over and over, and causes different problems each time. Maybe we can give it its long overdue, cool-sounding name in French. Any suggestions? A friend has offered some possibilities, which I’ll bring up later. The retake is usually the first bowing that has to fight gravity and work with it. A beginning violinist starts with détaché and has no inkling that sometimes the bow will have to be in the air. Landing a bow is a lot harder than starting on the string. The bow should land as if it’s falling like a parachute, so it can prepare itself with the right sound. Too often gravity makes the bow drop too soon. The problem is compounded by the bow being lifted, and anti-gravity becomes an issue. No wonder the bow plops down too quickly. The player lifts and drops the bow almost simultaneously, which is no mean feat. When mistakes such as this occur on the violin, the abnormal variations on physics takes on very interesting and bizarre results. The speed of the bow plays an important role. Dropping a bow can unfortunately be accompanied by an out-of-control speed. Practice first the note that lands on the string to get an idea of what it will feel like. Many “landed” notes should have a sostenuto nature. Be prepared for a quick lifting of the bow during the retake followed by a slow bowing speed in the next note. Such speed relativity is an integral part of violin technique, just as left-hand glissandos are never the same speed as the prevailing tempo. If the lifting and the dropping are imploding, figure out how fast and abrupt the motions are happening. Then repeat the motion, this time as slow as the corresponding fast motion was. This will equalize the forces, and you will experience the correct ratio of speed. In other words, do the opposite of your usual retake. This method applies as well to keeping the proper height of the bow above the string. Chaotic retakes interfere with the natural cycle that we expect in this technique, and both speed and height will be affected. We started our violin lessons in the Garden of Eden, in an even number of detaches with no bowing interruptions. Retakes changed all that. All of a sudden, the hair would drop too suddenly and too deeply into the string, causing a mixture of scratch, thud, scrape, and who knows what else. Instead of crashing into the string and being confused about where it is, try this technique instead. Make sure the bow isn’t hovering magnetically above or clinging to the string. The bow should feel comfortable in its own orbit. Then, with your rhythmic brain working as well as possible, start lowering the bow. The string will find the hair, rather than the hair finding the string. This is called “playing the air”. By staying more in the air than being too close to the string, it makes it impossible for the hair to get mired in the string. 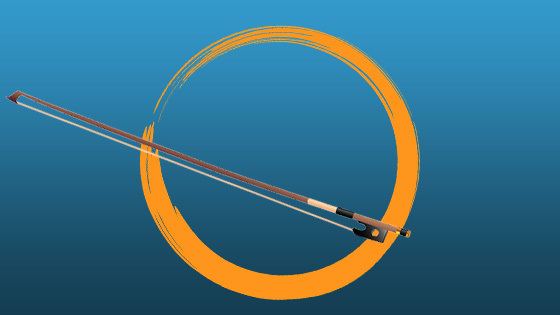 As the bow moves towards the target, the string will find its way to the hair naturally and will be perfectly in sync with the player’s inner rhythm. Don’t forget to include “engaging” the string when you make contact. This means that it takes a moment of consciousness to have the string start with full vibration. Think of it as a momentary touch or a gentle kiss. June 19, 2018 at 01:59 AM · I suggest « Rattrappé » which conveys the meaning of retake or re-captured! June 19, 2018 at 11:34 PM · Paul, that is indeed a useful analysis of the problem. My violin teacher taught me about engaging the string at a fairly early stage in my learning (I was a middle-aged learner on the violin). The objective was to get rid of the "airplane landing bow bounce" I had when dropping the bow on the string. Initially I was told to place the bow on the string, rest it there for a second or two with a little arm weight and wiggle it on the string so as to feel the connection between hair and string, and then draw the bow to produce the sound. As lessons progressed the resting time on the string was reduced until I was able to "drop" (which is actually a controlled placement) the bow on the string and virtually instantly draw out a good tone, the start of which had the typical "bite" to it, and no dreaded bounce. My teacher was careful to illustrate every aspect of the technique as she explained it. As a result I haven't had problems with retakes. June 20, 2018 at 01:16 PM · Thank you for the excellent suggestions! June 21, 2018 at 03:03 AM · Another incredibly helpful article!! I was working with my string quartet tonight and the "retake" was giving us problems in one specific passage. Part of the issue is that we didn't know how to refer to it. I'm with you! Let's give it a fancy French name and then we'll all be better off. My vote: "Récupérer." Somehow the idea of "recuperating" is more helpful than "retaking." June 21, 2018 at 11:33 AM · Une reprise is already the noun form derived from the past participle of reprendre. So if derived from reprendre, I think reprise rather than repris. Rattrapé is not as pretty a word and sounds a bit awkward as a past participle-to-noun imho. June 21, 2018 at 03:59 PM · All the terms collé, sautillé, détaché, martelé, sautillé, etc... are all participes to the verb form, as rattrapé is (from verb rattraper, which me and t’étale or recuperate). You may not like the word itself and one could find another, but the form should Be consistent with all the terms use fin the bowing terminology. By the way, if reprendre is your choice, then you should use repris and not reprise, both for the sake of consistency and because the bow is masculine in gender and reprise could either be understood as feminine participe or as a noun. June 21, 2018 at 08:18 PM · Permit me to second "Rattrappé." Brilliant suggestion.